Pixelpipe, a San Francisco-based startup that offers a ‘content distribution gateway’ that allows people to upload text, photos, videos and other files to a variety of social networking and media sharing sites at once, is debuting a new service today, called Pi.pe that aims to help move content across services. We have 1,000 invites for TechCrunch readers to use the service; you can enter the code ‘techcruncher’ here. While Pixelpipe allowed is focused on getting media off of phones or desktops onto your social services, Pi.pe service is all about moving content from your Flickr account to Facebook, or from your Instagram account to Dropbox. The startup has made it fairly simple to copy one to thousands of items in just a few clicks between services. On Pi.pe, you can authenticate your accounts with 12 services, including 500px, Facebook, Facebook Pages, Flickr, Instagram, Kodak Gallery, Myspace, Photobucket, Picasa, Shutterfly, SkyDrive and SmugMug. Once authenticated, you see your files from these services on Pi.pe and click which ones you’d like to transfer to another service. The startup says the back-end has been built to scale to hundreds or even thousands of transfers a second. You then authenticate with the storage or media service that you want to import the photos to (these include, 500px, Box, Dropbox, Evernote, Facebook, YouTube, Flickr, Picasa and others). 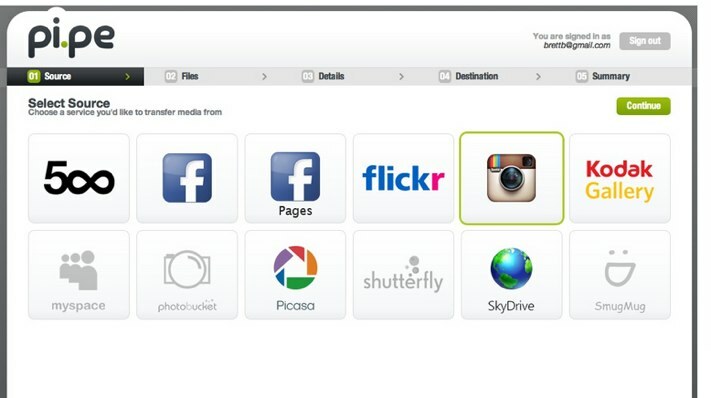 For example you would be able to back up all of your Instagr.am photos to Dropbox, print them at Shutterfly or post to 500px. Or your could import photos to Facebook, and Pi.pe will parse the EXIF information and insert the media into your timeline on the date it was captured. As founder Brett Butterfield (the former director of R&D at Kodak) explains to me, Pixelpipe was more of a broadcasting service and Pi.pe aims to help users solve the distribution problem they may have when photos are collected across a number of services. Building the ability to import and export has been technically challenging, he says, but he believes having a central repository where you can easily pull and push files will be inherently useful for consumers. Butterfield says that the company will be working on adding the ability to import and export audio into Pi.pe, and will also support other types of files in the future, such as documents and more. Pixelpipe, which has 1 million users and has distributed 40 million photos and videos, has raised $2.3 million in funding from investors including James Joaquin and Russ Siegelman.